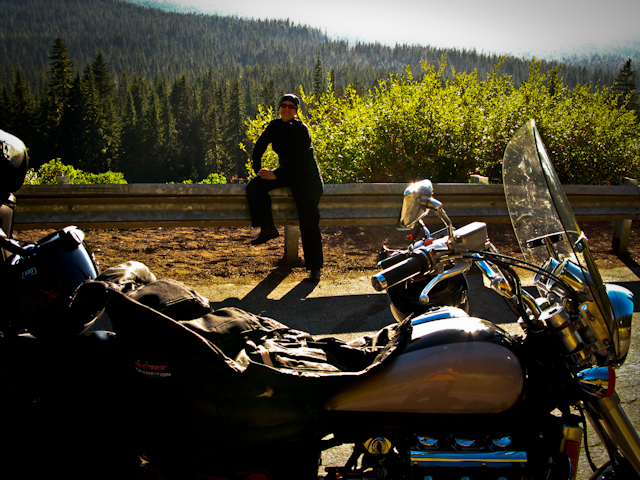 BACK TO THE USA - We're going "home" to motorcycle cross-country!!! We're going home - for a visit! 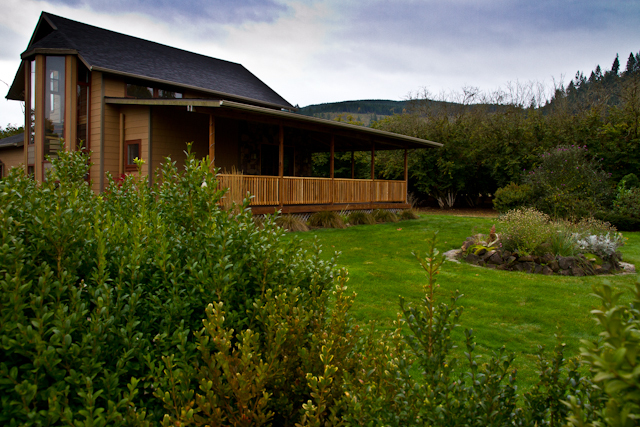 Yes, Oregon will ALWAYS be home for me. 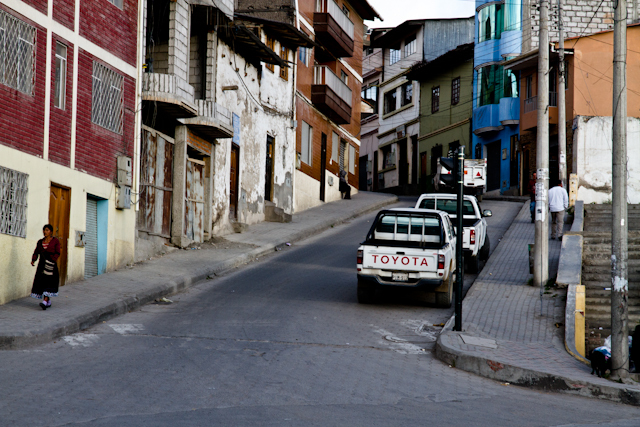 Many ex-pats can now call Cuenca "home," but I haven't arrived there yet. We've been here for eight months now, and we're still learning how to live in another culture, how to adjust to less and live a more simplified life, how to keep our eyes on what today has to offer and not look to tomorrow or yesterday, and how to live in an apartment in the heart of the city instead of a house in the quiet solitude of the country surrounded by land. Oh, and how to be "Jubilados!" Not working has also been something we're learning to do. It's been such a life-changing experience to repack our bags, simplify our lives, leave the familiarity of the USA and move to another country. 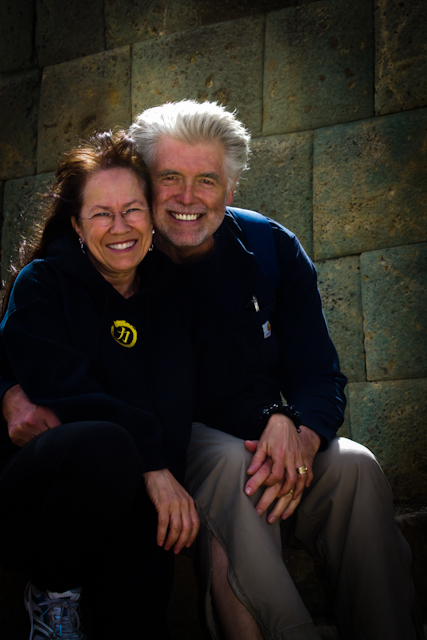 A very dear friend of ours had a severe stroke the beginning of June, three days after he and his wife returned to their home in Cuenca after their two month vacation in the states. One night they were at our apartment toasting their return back to us and three days later....... "Suddenly!!" Now both their lives have changed from what they thought it was going to be upon their return. Our friend continues to improve "poco a poco," but the healing journey is going to take time, patience, and on-going costly medical care. His wife is my hero - she is so strong and determined, and she is taking phenomenal care of her husband 24/7. 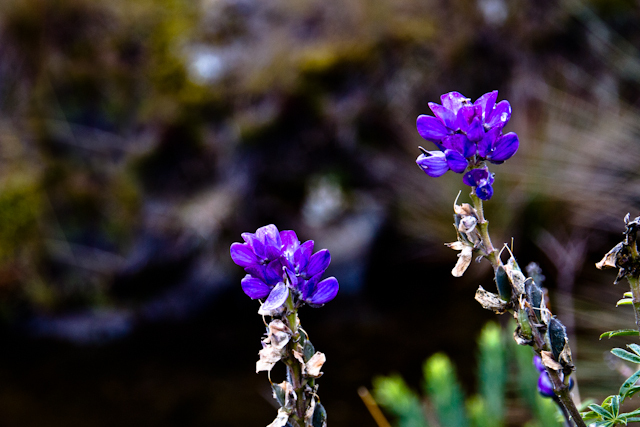 Their days of dancing together (which is how they met back in the states) and taking day hikes to their favorite places in the Cajas is now on hold. He cannot talk and is partially paralyzed. He has been through extreme pain and more unexpected medical procedures. Yet, he always lights up and smiles when Bo and I go to visit him. He is improving and getting stronger day by day. He's a fighter, and he will prevail because of many continued prayers, his devoted wife's strength and wisdom, on-going physical and speech therapy, and family and friends who love him and are cheering him on. I have been able to support his wife by accompanying her to the doctors and also to be with her when her husband was in the hospital. I now know more medical words in Spanish than ever before. 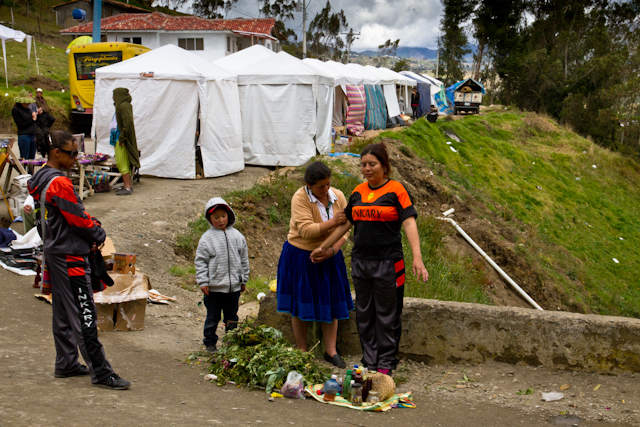 It has also shown me the kind of medical care that one receives when entering the emergency room or is admitted to the hospital, and the final costs of emergency and in-hospital medical care in Cuenca. I've seen the good, the bad, and the ugly of the health care here - but that is everywhere. There are medical professionals who enter this field for the money, and their are the truly gifted, brilliant, and compassionate doctors and medical staff - the ones who truly care and make all the difference in the healing progress of their patients. I have seen my friend being treated by doctors who act like they care and by doctors who truly care and actually know what they are doing. 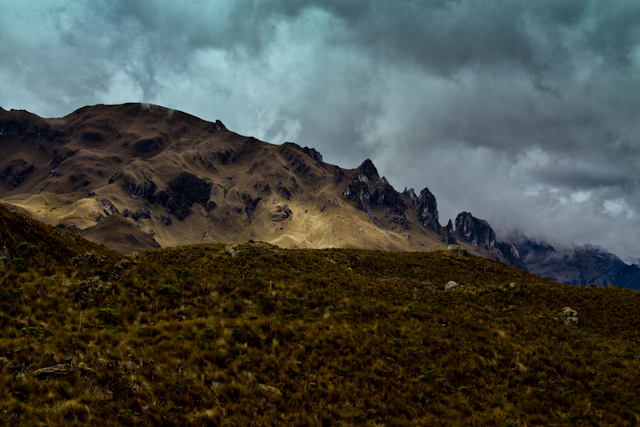 Again, it has nothing to do with Cuenca or Ecuador. It's all about the gift and wisdom and compassion of the physicians and caregivers. This sudden and unexpected illness of my friend has caused me to do a lot of thinking lately - about the preciousness of LIFE! Life is so precious and not forever - well at least not forever on this earth. While we're on this earth, I want to focus on the important things and live for today because tomorrow may never come for us, or at least not as we expect it to - financially, relationally, nor health-wise. Even if tomorrow comes, we may not have our health to do the things we love. Bo and his much-missed Valkyrie! 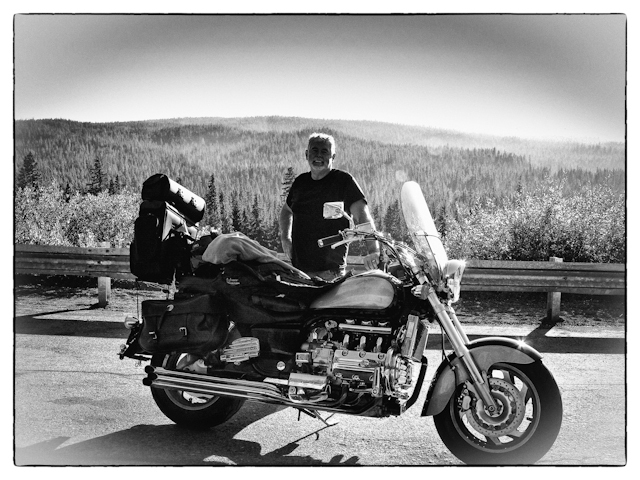 Therefore, God-willing, Bo and I have decided to live one of our dreams - to motorcycle the USA cross-country on our Valkyrie and visit family and friends along the way. 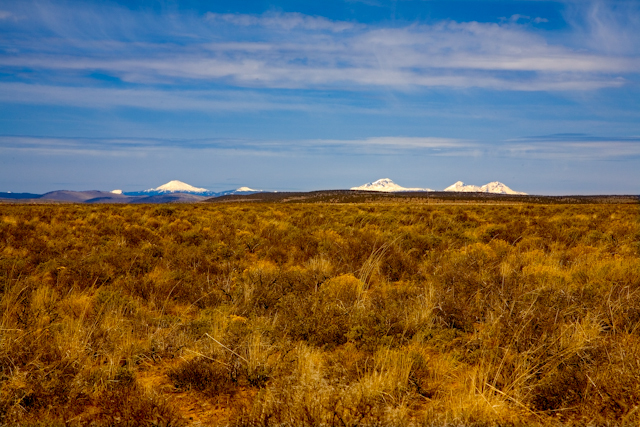 We'll stop and see Glacier, the Grand Tetons, and the Badlands. We'll visit a dear friend in Minnesota who is in her final stages of Cancer (I pray we make it there in time). We'll see family and friends as we ride through many states, and then we'll visit the New England states and stay at Bed and Breakfasts to celebrate our anniversary and a replay on where we spent our honeymoon 22 years ago (Yikes, that long ago???). 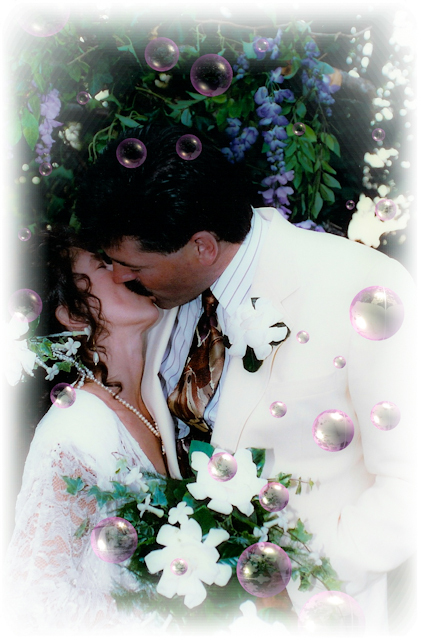 September 21, 1991 -Until Death Do Us Part! It's been a busy week, visiting our friends here in Cuenca and saying "Adios," for now, making lists, and taking care of last minute details as we get ready to pack and close up our apartment for our LONG journey back to Oregon. I haven't seen my mom in eight long months, and that is going to be the highlight of my trip. Bo and I adore her. 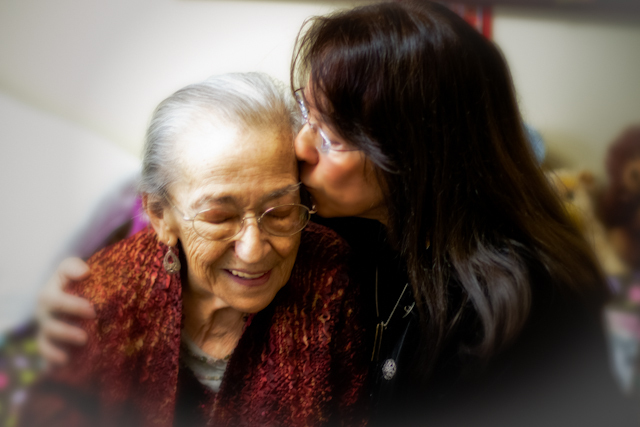 My beautiful mom - She's 87, has advanced dementia, and I pray to my dear Lord she still remembers me after not visiting with her for eight long months! To visit friends and family will also be a joy. I'm not especially looking forward to sorting through our STUFF, yet that is another task that we will focus on while in Oregon. We had considered shipping a pallet or two back to Cuenca, but I finally came to my senses AGAIN (this is a hard part of my journey - not having my STUFF), and we are going to fly to Oregon with empty suitcases and bring back only our well-thought-through needs. I continually remind myself (and Bo also reminds me) that a big part of leaving our lifestyle in Oregon was to truly SIMPLIFY OUR LIVES!!! That means living with less here - and certainly without all the "wants." I'm at peace about this. The more STUFF we accumulate here, the less ease and freedom we have to "GO" should we decide to!! It's going to be strange going back to our house that is rented, where our STUFF is in storage in one of the out buildings. It's going to be even more strange to get in my Acura and drive again while we are visiting Oregon. Yes, I miss my car and zipping around in it - but I don't miss paying for car insurance, gas, or car repairs! It will also be difficult to go to our land and not be able to enter our home - since it's rented (to the best renters we could have ever asked for - so responsible and they love our home and care for it as we did. Thank you Mike and Karyn). 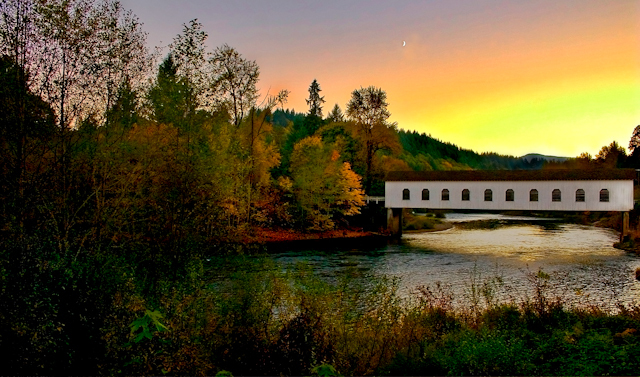 Our beautiful Oregon home of 40 years! I look forward to staying with one of our special friends, and being only 1/2 mile from the Walterville Pond - a place I walked or jogged around in the early mornings. 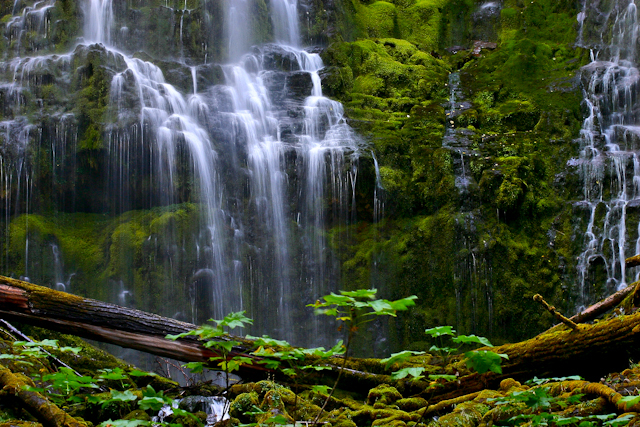 We'll take a drive up the scenic McKenzie Pass and see the Three Sisters mountains and many other breathtaking areas, such as Proxy Falls and many other rushing waters, and beautiful Eastern Oregon. 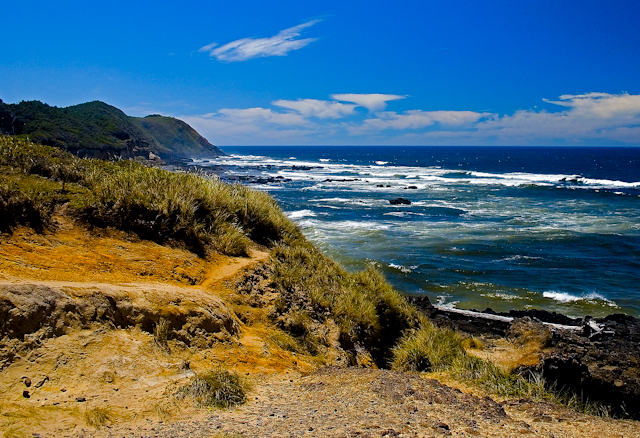 We'll also take an hour drive from home to see the incredible Pacific Northwest coast. 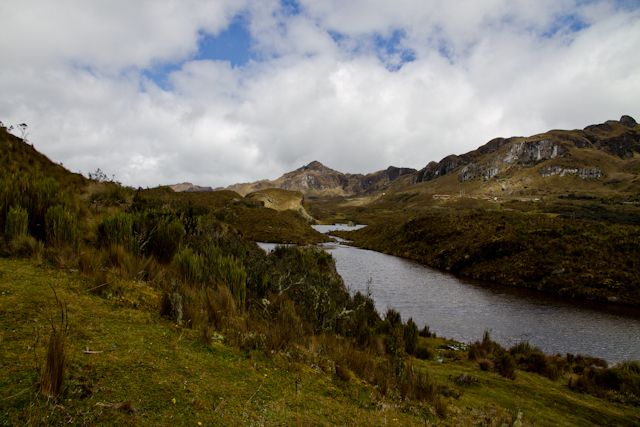 Tomorrow evening we leave from Cuenca to Quito, spend the night, and on Tuesday morning we begin our long day journey from Miami to Oregon via LA. We arrive in Eugene at 10:30 pm. Because we purchased one-way tickets, our time is open, and we have 90 days to be out of Ecuador. 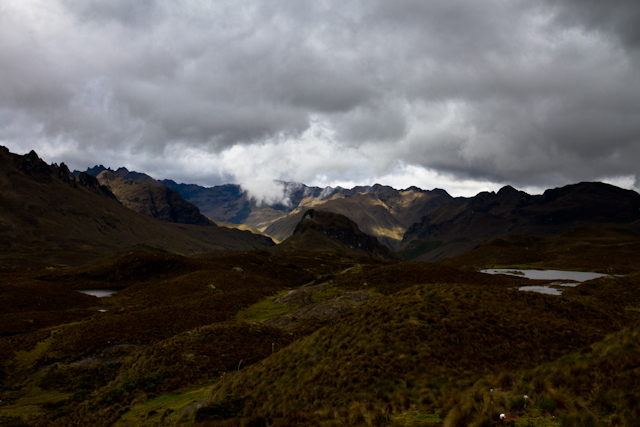 We return back to Cuenca the beginning of October, so we have lots of time to visit "home" and travel the USA. It's going to be quite the adventure, but we are going to be flexible in case our plans do change. I will blog about our USA journey, but that will always depend on where we are and, of course, internet access. For now, may our readers continue to enjoy our blog, and get ready to follow OUR JOURNEY BACK TO THE US of A!!! O BEAUTIFUL AMERICA, Here we come!!!! Words: Katharine L. Bates, 1904. Music: Materna, Sam­u­el A. Ward, 1882 (MI­DI, score). 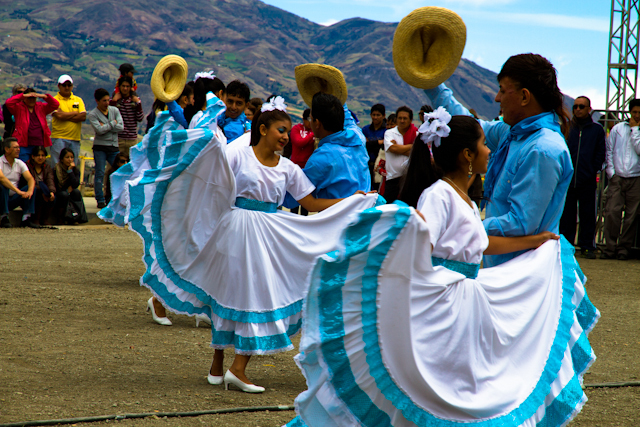 INGAPIRCA ECUADOR during INTI RAYMI - Our visit to the Incan Ruins! One of many dreams on my bucket list of places to see is to one day visit Machu Picchu in the Cusco region of Peru. 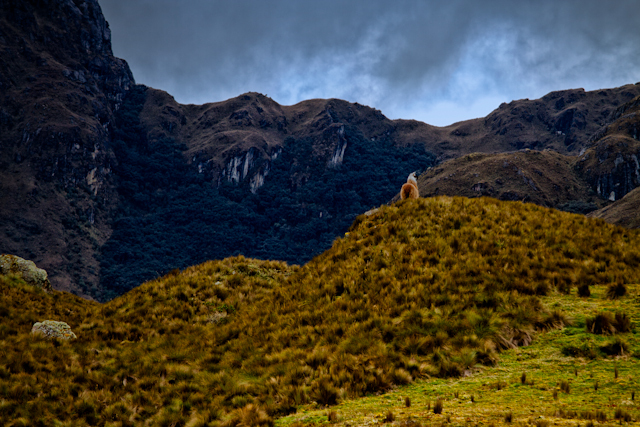 It's one of the most visited sites in all of South America and one of the greatest historic places in the world. Well, I'm closer now than I've ever been living in Cuenca, Ecuador, so I'm sure this dream of mine will be realized one day soon. In the meantime, the Ingapirca ruins will have to do. 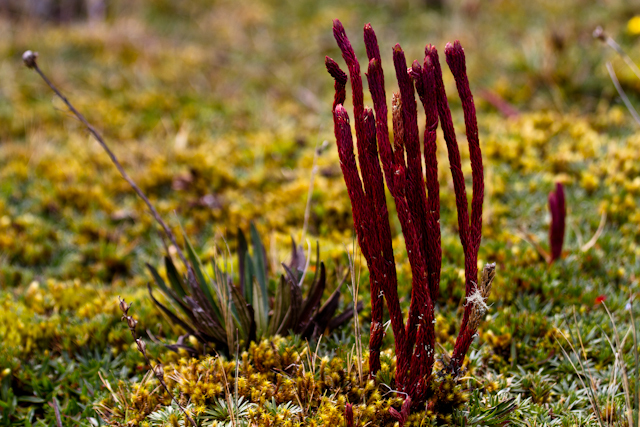 I've read a few negative reviews by world travelers who have been to the most spectacular of ruins in this world, saying Ingapirca is disappointing and not that big a thrill. 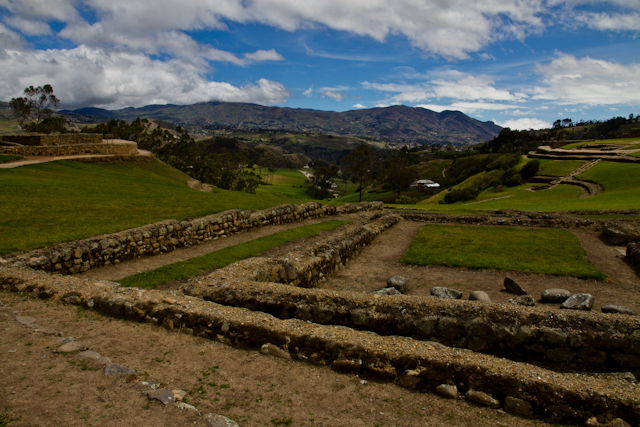 I, however, found this area, which is so close to Cuenca, to be a wonderful day trip and area to visit and a joyous celebration time during the Inti-Raymi festival. 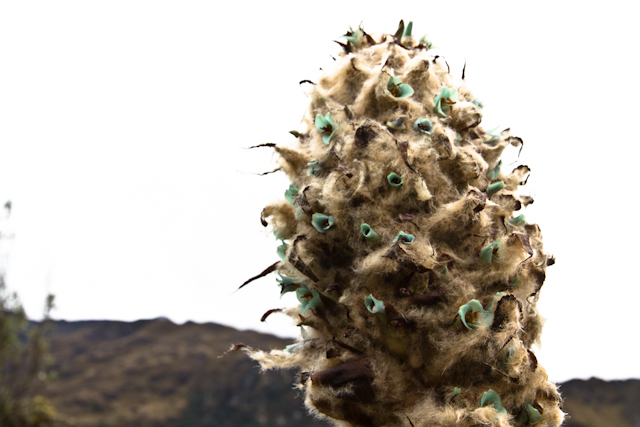 We went with friends via bus (oh, how I love hopping the bus to see the sites of Ecuador), and boarded early for a 2-hour ride north of Cuenca to the town of Ingapirca. 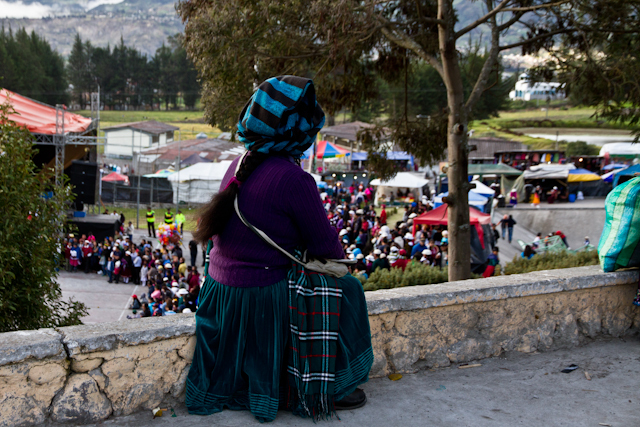 The weather was warm and sunny, and we were ready for a blue-sky day of Incan music, artistic vendors selling their crafts and wares, festive dancing and a joyous celebration of this yearly Incan fiesta. 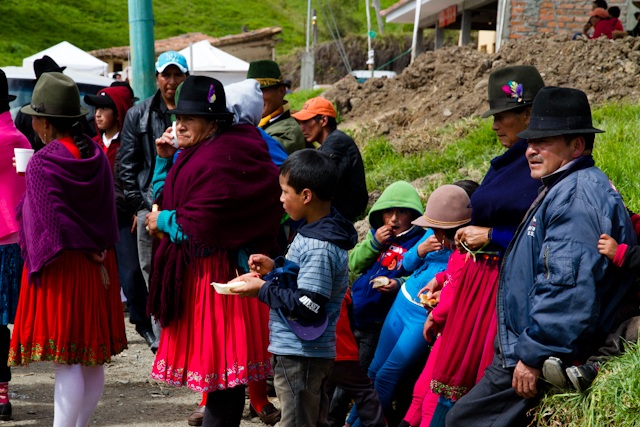 There were many different cultures visiting from Peru, Bolivia, Columbia and other areas outside of Ecuador. The costumes were colorful and the dancers were joyous and entertaining. 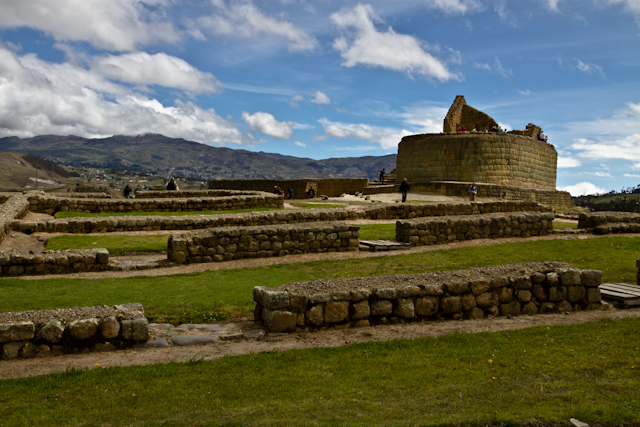 Inti Raymi is the "Festival of the Sun." 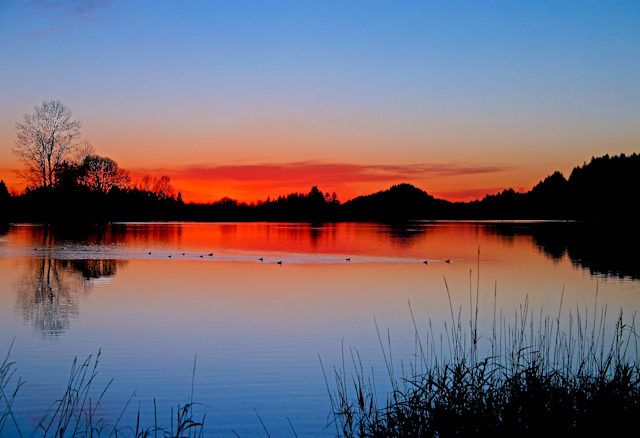 Yearly, it is celebrated around June 21st, the shortest day of the year (originally it was celebrated during winter solstice). 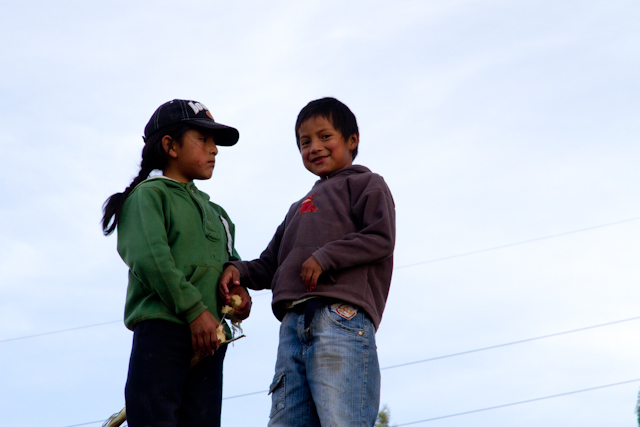 It is to honor their Incan God Inti. 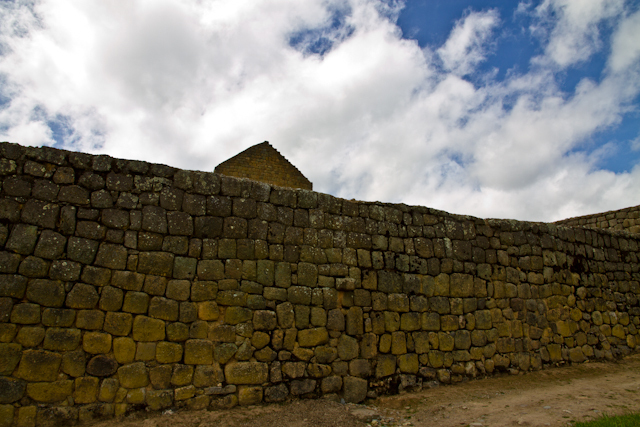 The fee to enter the ruins was $10, but because of our cedulas, we were charged only $2 each. A tour guide is provided as groups of people are ushered through the gate to see the ruins. We ended up with an English-speaking guide , so that made it a bit easier on some to understand the history of the ruins. Because I was more focused on taking photos than staying with the group to hear the guide's in-depth history of the ruins, you'll have to google it. For me, photography rules!!! 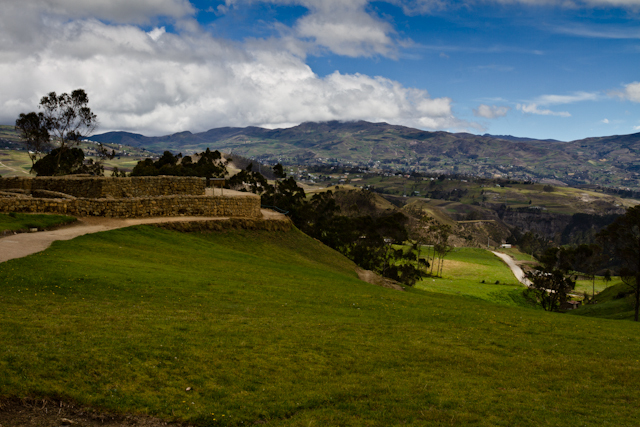 It was a very relaxing and fun day for us and our friends, and we recommend going to see this area of Ecuador that is so close to Cuenca and also because it is a very scenic ride there and back. Also, the town of Canar (Can-yar) is another place to visit on the way. Will we go back there? Maybe! 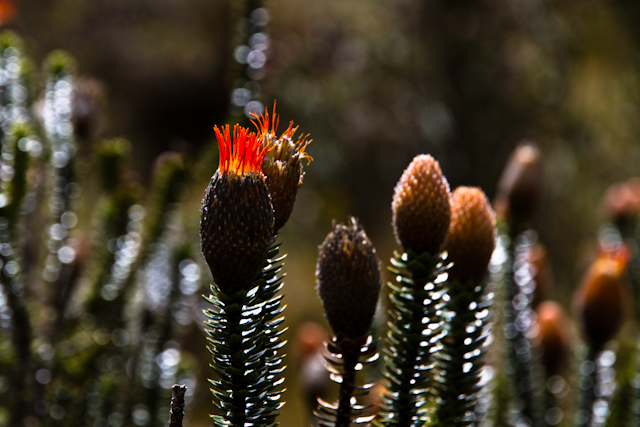 For now, it's another area we've experienced in this beautiful country, and we're ready to move on and see more. 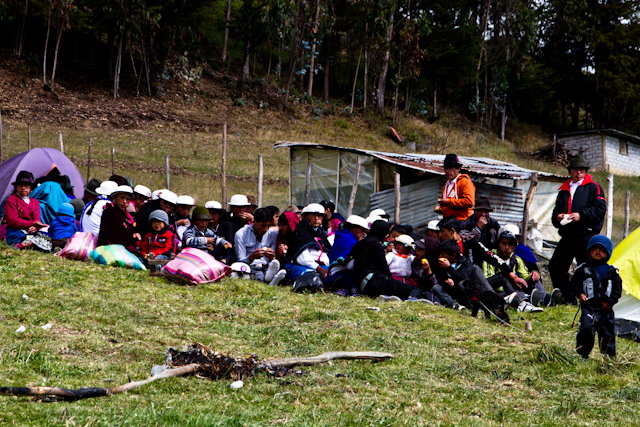 Now for some photography to show you Ingapirca during Inti Raymi through my lens. Enjoy! 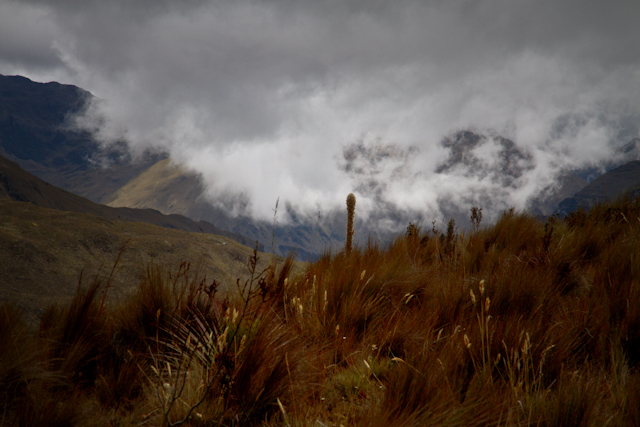 We departed on an 8:30 am bus and enjoyed the scenic ride to Ingapirca. This little girl was fascinated by the big man sitting behind her (Bo!). 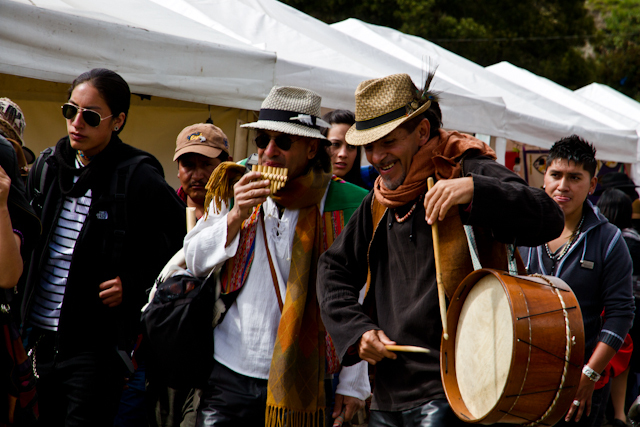 After arriving in the town of Ingapirca, we walked past many vendor tents and headed for the dancing and ruins. We passed a young woman receiving her "spiritual cleansing" from a shaman woman. 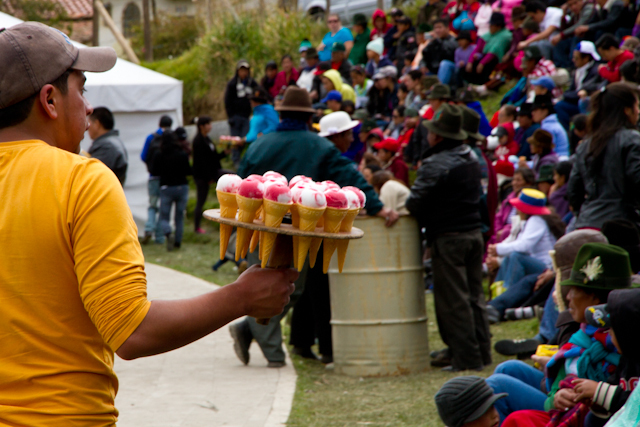 This is a common ritual performed during all of the celebrations and holidays in Ecuador. Those who participate believe it will rid them of bad energy/spirits or illness. The shaman rubs the victim, I mean client, down with a candle, rolls a hard-boiled egg around their body, and then pats them down with a bundle of strong smelling herbs. She also will spit on her willing or not-so-willing participant. That ought to do it, hey?? No spit, no cleanse. 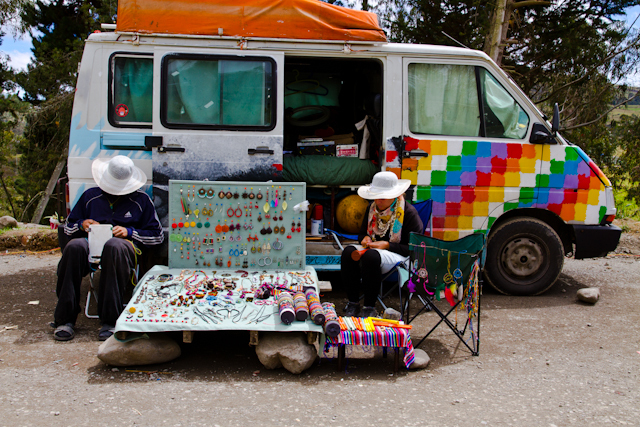 Ah, the carefree simple life of living in a little bus-van. I wonder where these artists will travel to next? 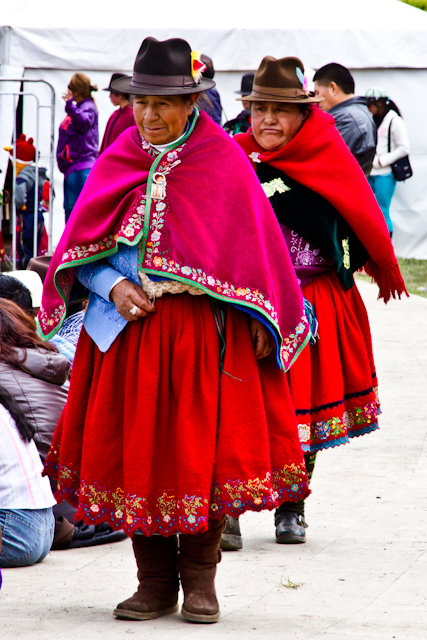 .....and the weather, Andean music, dance performers and costumes did not disappoint us. 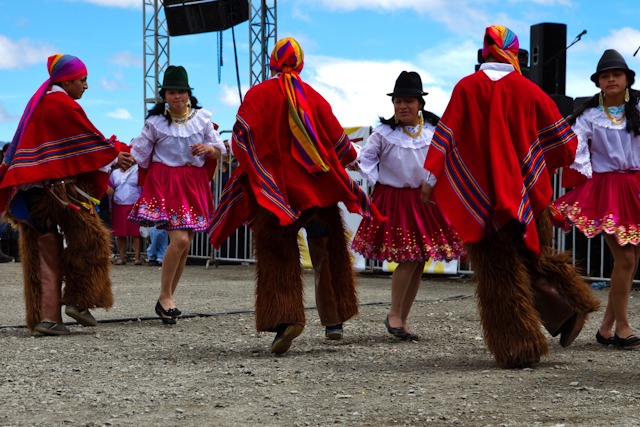 A variety of dance troops entertained the crowds in their traditional colorful costumes. Rocky uneven dirt roads don't intimidate those who love their "tacones altos!" These are actually low heels compared to some platforms and high heels we've seen at these fiestas. 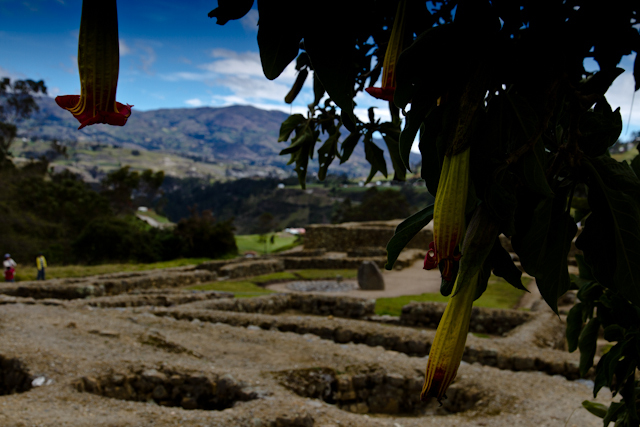 Imagine standing for hours in these - and hiking all around the ruins? Ouch.... Here, beauty rules! The older generation stick to their traditional attire for every day wear. It was time to do our "ruins" tour. ......and walking and touring the ruins was fascinating. 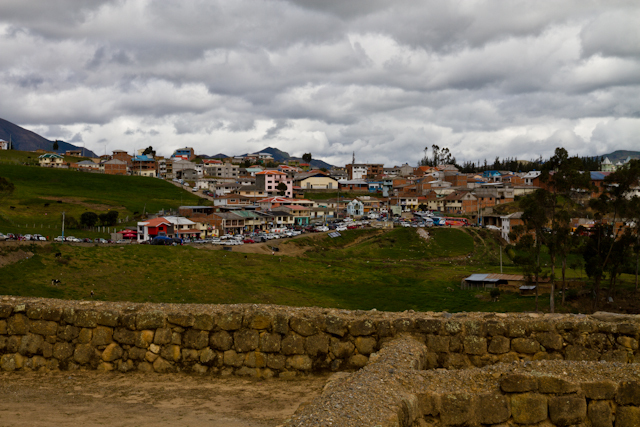 I was able to capture the town of Ingapirca from the ruins with my telephoto lens. That is where the bus let us off, and it's a short walk to the ruins. Our English speaking tour guide shared lots of history about this area. 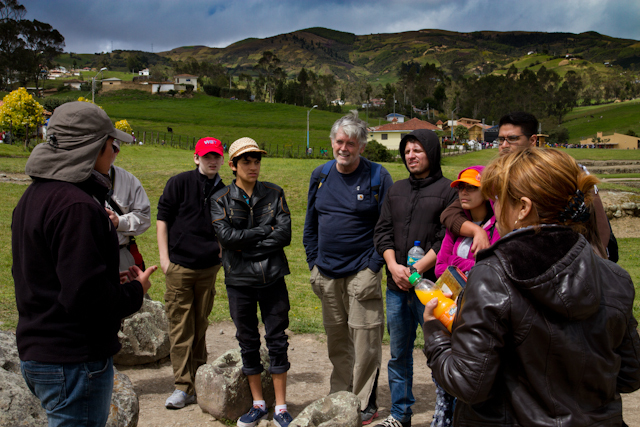 I'm not sure if the Ecuadorians in our group understood what he was saying! It was time to head back to the town and take a bus into Canar (Can-yar) where we would see more celebration and then have dinner before heading home. 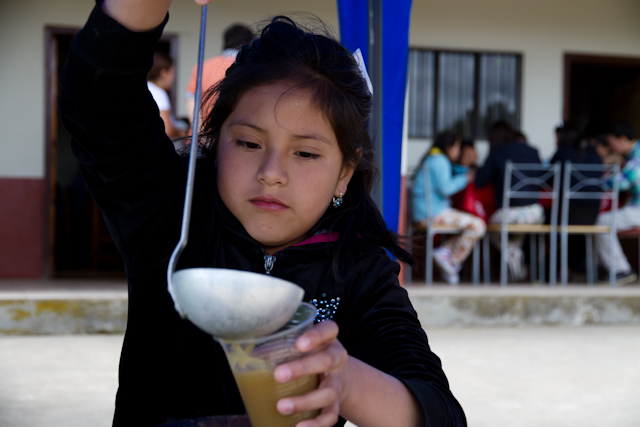 On the way to the bus, we had a delicious traditional Ecuadorian hot drink called Canelazo which is made with spiced cinnamon, naranjilla and herbs, being poured by this precious young girl. .....where another celebration was in process. This woman seems to have a perfect view. Her attire fascinated me! 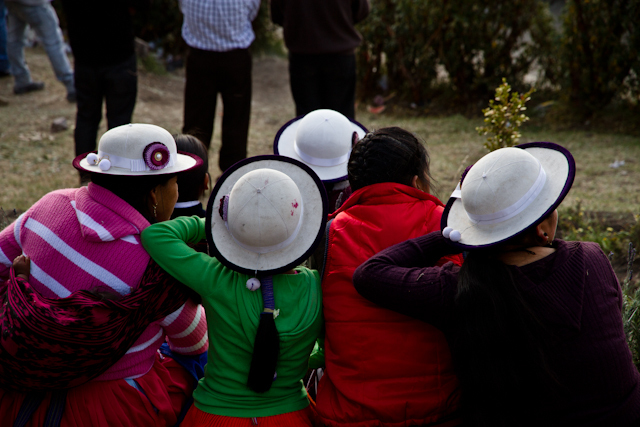 Women in their hats are a common sight in Ecuador. 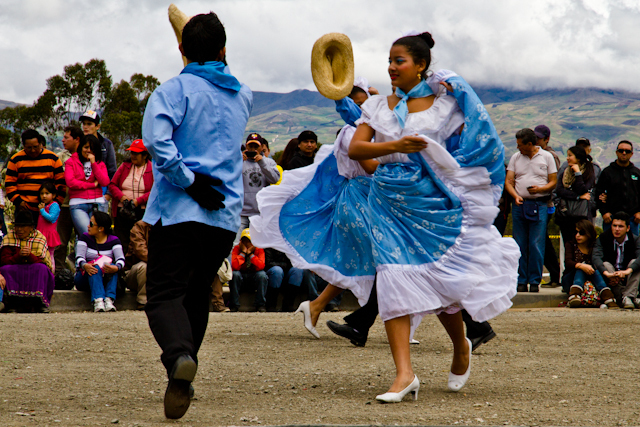 Each culture has their unique and personal traditional style. 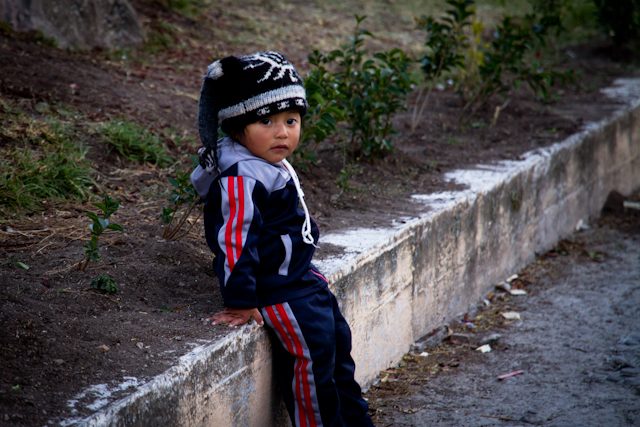 Ecuadorian children always stare at us when we stroll by them! When they catch me photographing and capturing their moment, they always smile! 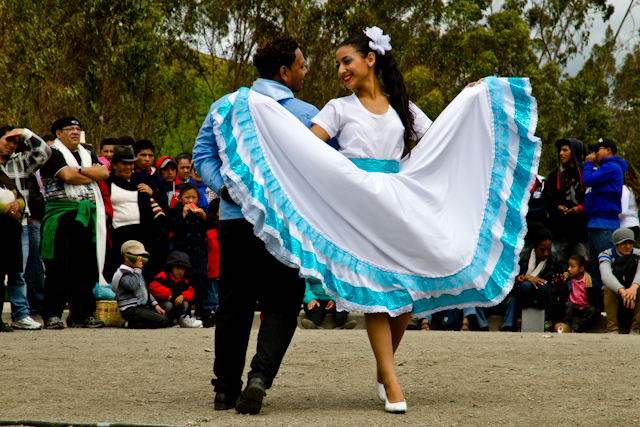 By early evening, we had seen enough dancing and celebrating of this yearly South American event. 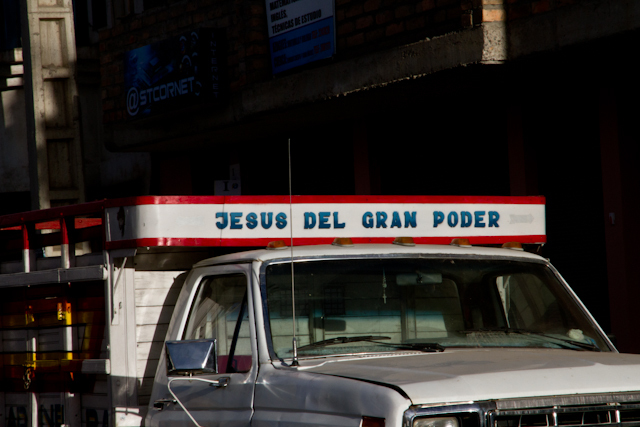 As we headed to the bus "parada" to hop our Cuenca ride, I captured this parked truck's sign (Jesus The Great Power). 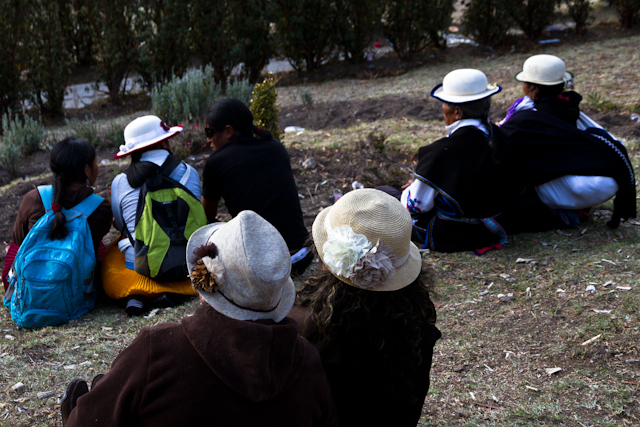 I was reminded of the freedom of religious expression so common here in Ecuador. This is one of the sweet things I love about living here. 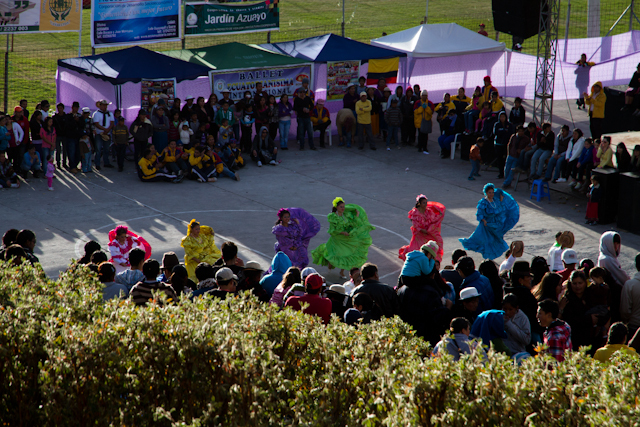 Thank you friends, for inviting us to join you this day to celebrate Inti Raymi together. 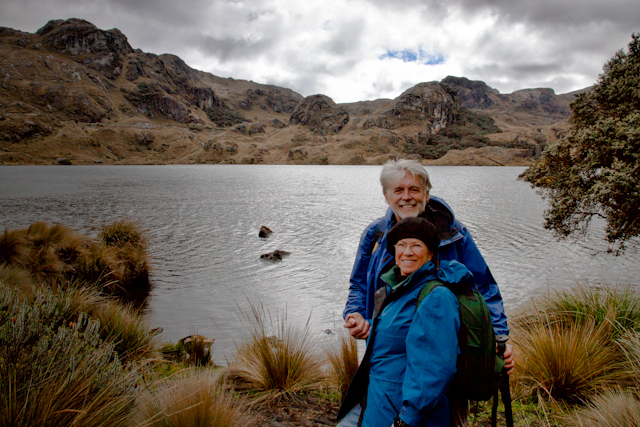 Thank you, Jim, for capturing this photos of Bo and me at Ingapirca. I'm surprised you got all of Bo's hair in the picture! 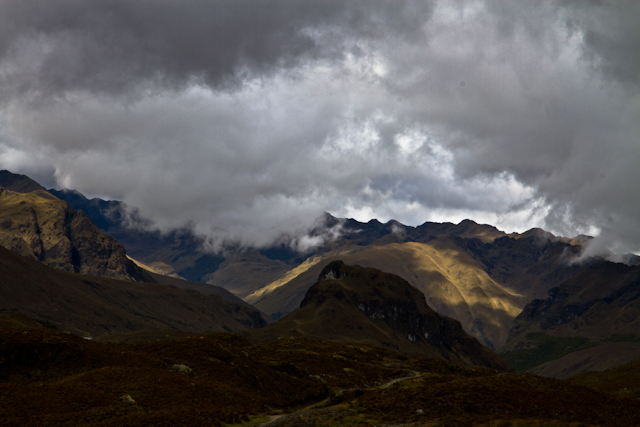 Yes, we're starting to see more and more of beautiful Ecuador. Be looking for our next adventure as we decide, "Where shall we go next?" 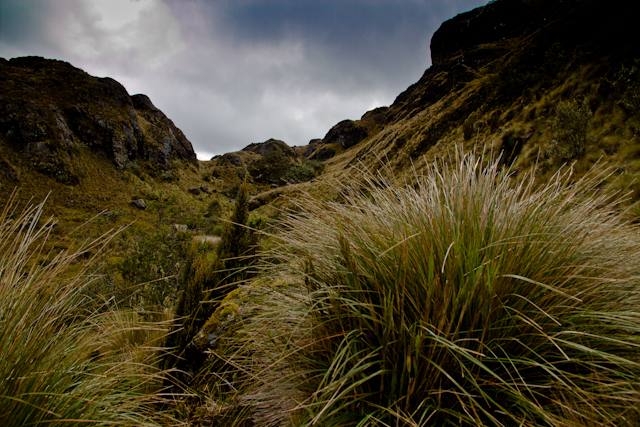 El Cajas National Park in Ecuador - Our first day hike in the Cajas! 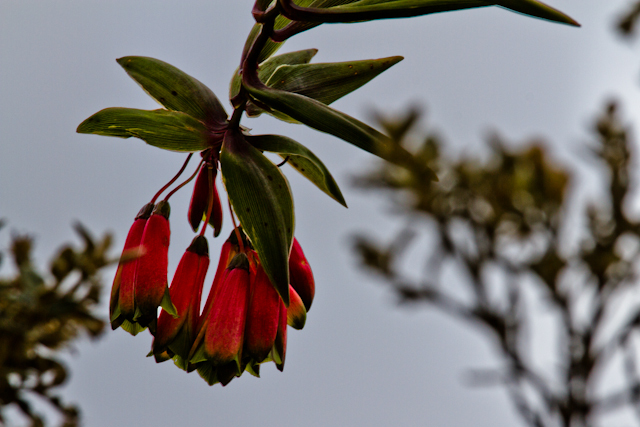 Now that we have our residency visas and cedulas, our plan is to begin to explore more of beautiful Ecuador, and also to eventually visit other South American countries. 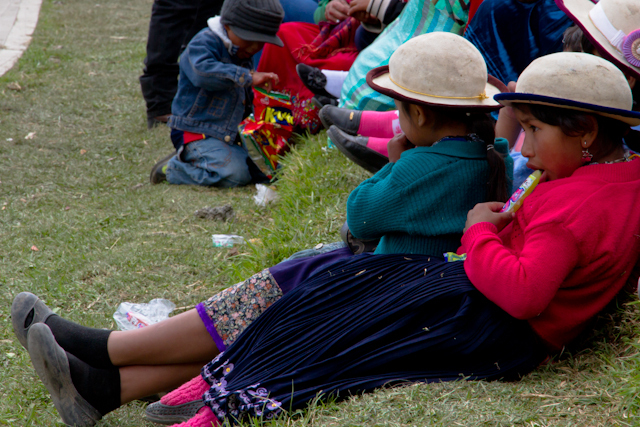 In the past few weeks we've visited Ingapirca for their Inti-Raymi celebration, we've ridden city buses to the end of their route and explored the outskirts of Cuenca, and we even went to Peru for a long weekend! 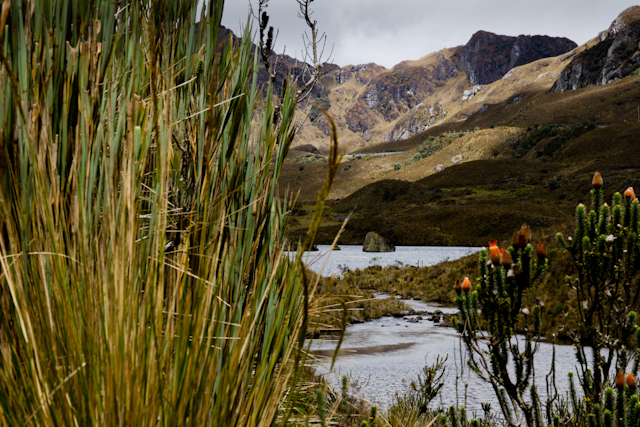 A few days ago, we made our final plans to take a bus to El Cajas National Park and spend the day hiking and photographing this majestic area. 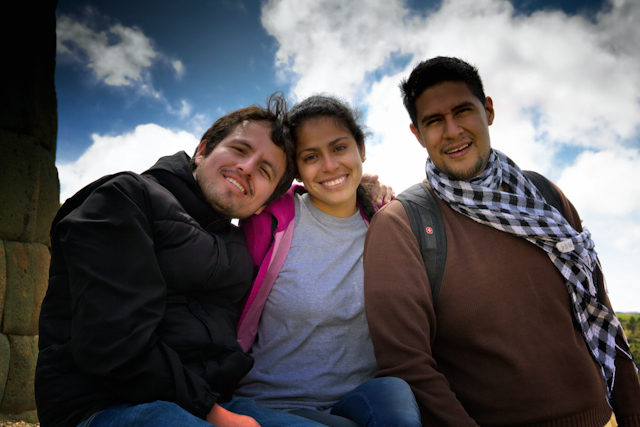 Well, two days before our scheduled trip, we met another "Blog Friends" couple visiting Cuenca whom we invited to join us. 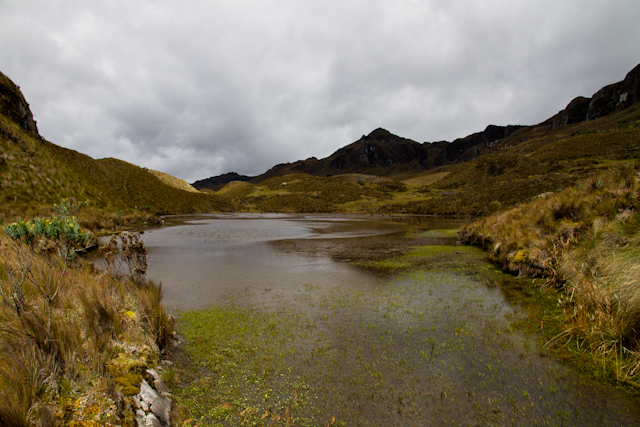 So, how to dress for the Cajas? Layers and warm clothes! 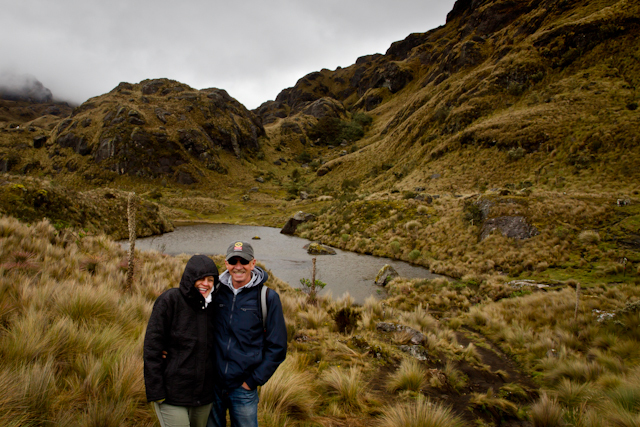 Our friends purchased warm jackets the day before our excursion knowing it would be cold at El Cajas elevation (hikes range from 11,000 to 15,000 feet, from what I've read). I had my Gortex raincoat and lots of warm layers underneath, wool socks and hiking boots, a scarf, and a wool hat and gloves. Yes, it was that cold this early overcast and windy morning. I'm glad I did enough research to know the importance of dressing for this occasion. 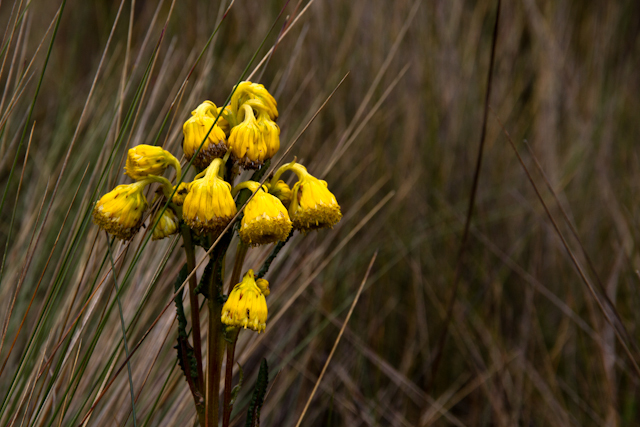 To be cold and wet is a miserable experience when hiking in the mountains. We also brought lots of water and snacks for the day. After registering, we headed down the wooden stairs for Trail #1. 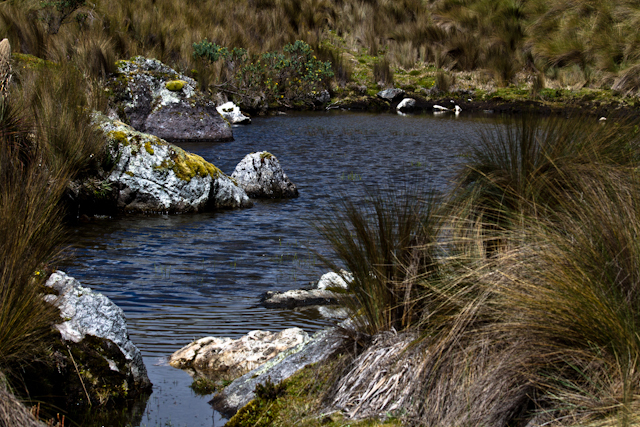 Because it was our first visit to the Cajas, we wanted our day to be leisurely and fun, and we were all aware that we would probably run into some mushy muddy areas along the trail. 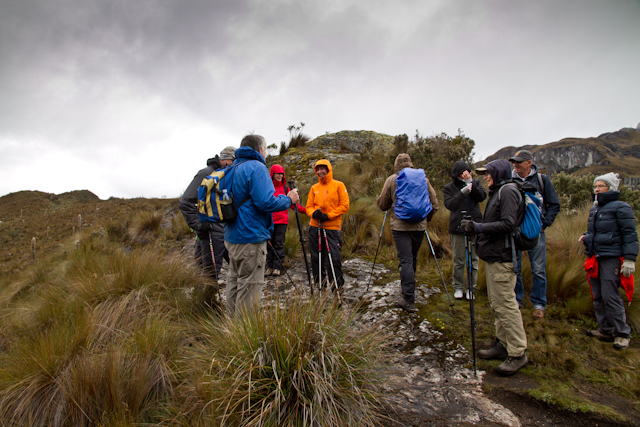 Our first Caja hike began at 10 am and we were back at the lodge by 3:00 pm. It was a fabulous day of constant weather changes (it never rained - yea!!!) from overcast clouds and chilling winds to warmer and calmer sunny blue skies. The cloud formations were magical, the scenic mountain views were beyond words, and the lakes and foliage were unique and colorful. 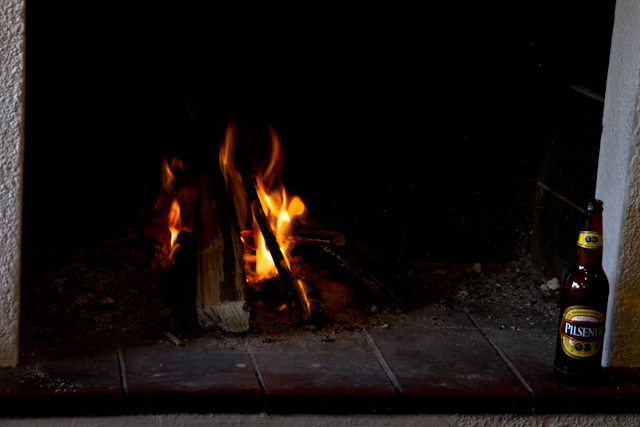 Back at the lodge, we sat by a warm crackling fire, finished our snacks with some cold beers, and rested up before heading back to the road and bus shelter. 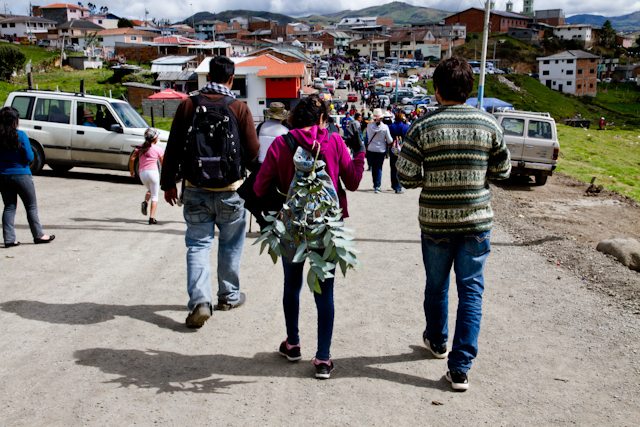 We caught a 4:30 pm $2 return bus to Cuenca and walked into El Centro from the bus terminal. 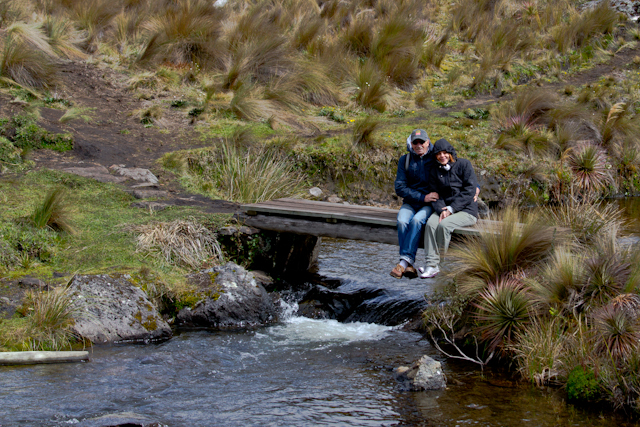 It was a fabulous day for all four of us, and Bo and I look forward to our next trip to the Cajas. 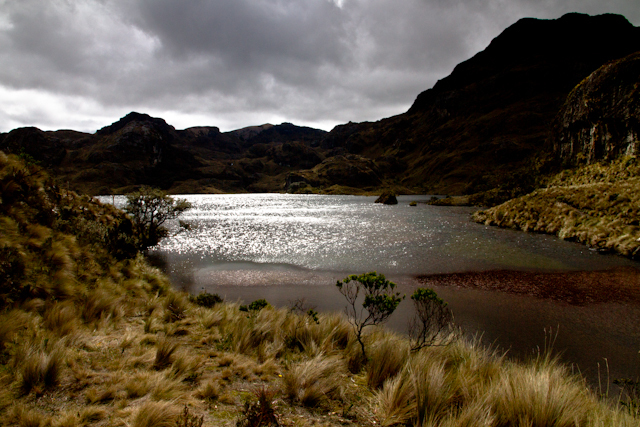 If you haven't been to the Cajas, you must! 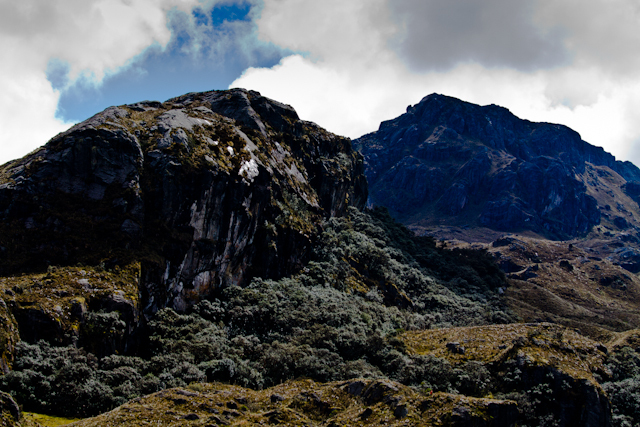 If you are unable to hike, I hope some of my photography will give you an appreciation for this majestic and scenic area of Ecuador. Enjoy!! Blog friends, Larry and Bea, are ready to brave the cold! It was fun hiking with two fit and fun "go-with-the-flow" people. 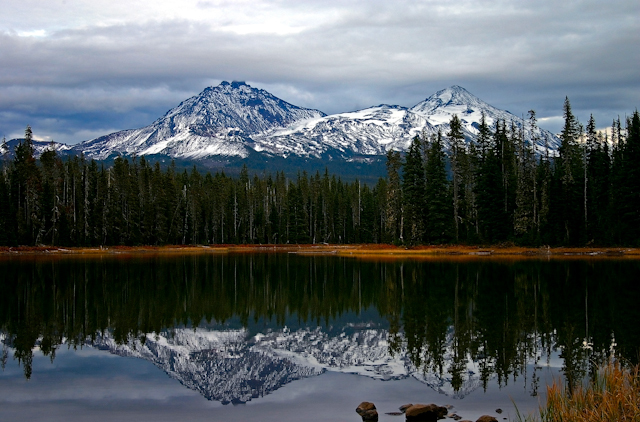 It's impossible to describe the beauty and majesty of this area. You have to see it to believe it! 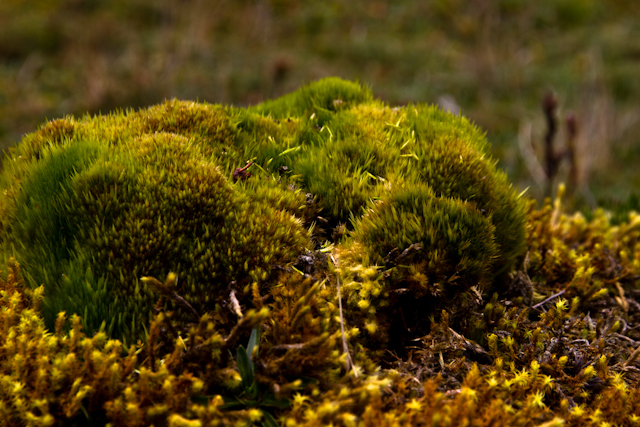 We were surrounded by sparkling lakes, sweeping grasses, and bonsai-looking trees along the path. Throughout the day, the weather would change from heavy thick white clouds to patches of clear blue skies. It never rained, and we were thankful for a dry hike. ......but most of the day we had the entire area all to ourselves. It was so peaceful and magical. .......others upright and glistening in the sunlight. 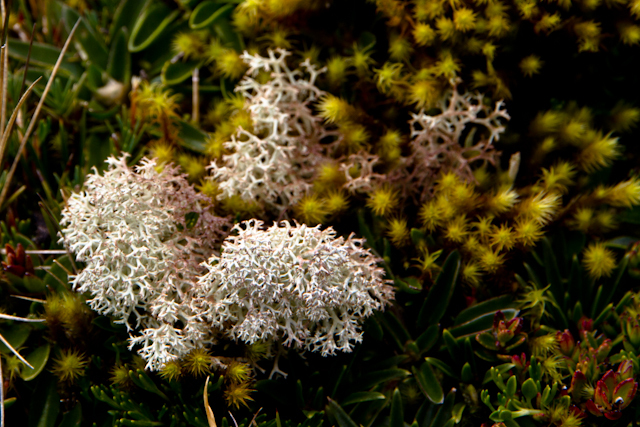 Many of the plants I have never seen before. 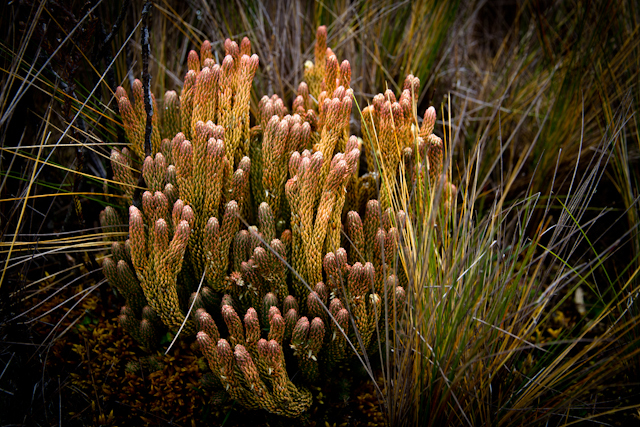 I wished they had a pamphlet at the lodge to help identify these unique South American species. 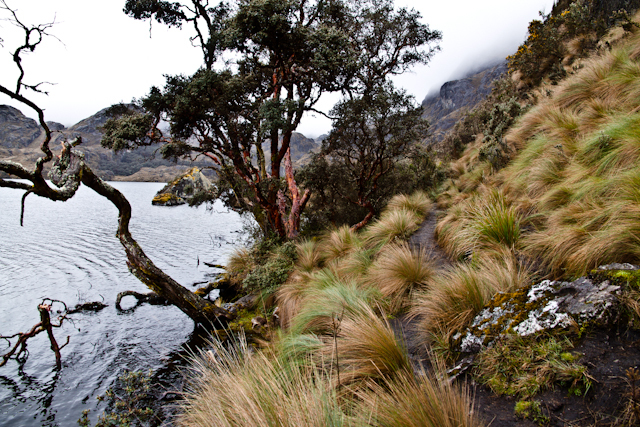 Colorful succulent plants and tall bamboo-like grasses bordered the lakes and mountain peaks. Our friends take a break along the trail. 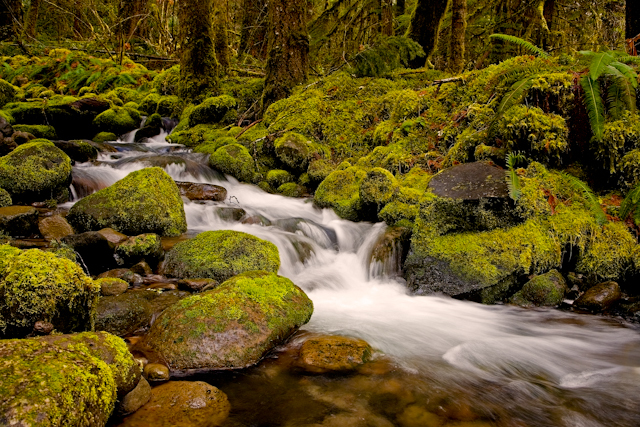 Every turn revealed more and more beauty and peacefulness. Sometimes it felt like we could touch the clouds. 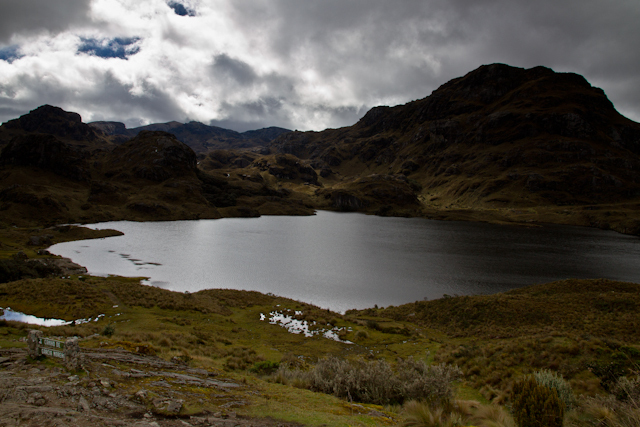 I've hiked through some amazing Cascade mountain ranges in Oregon, but the Cajas took my breath away! .....and thick clouded skies over glistening waters. 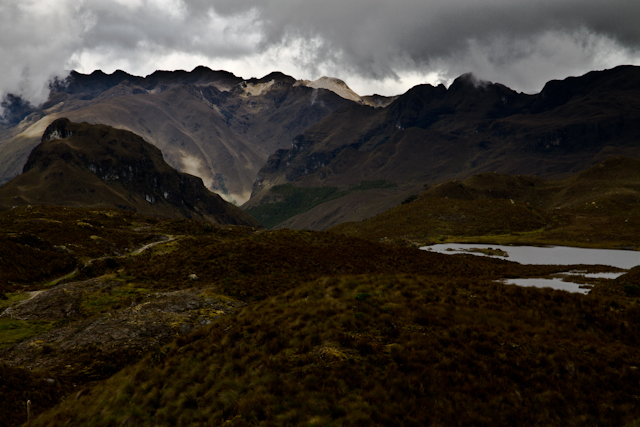 No two lakes or mountain ranges looked alike - every turn on the trail revealed the splendor of this area. 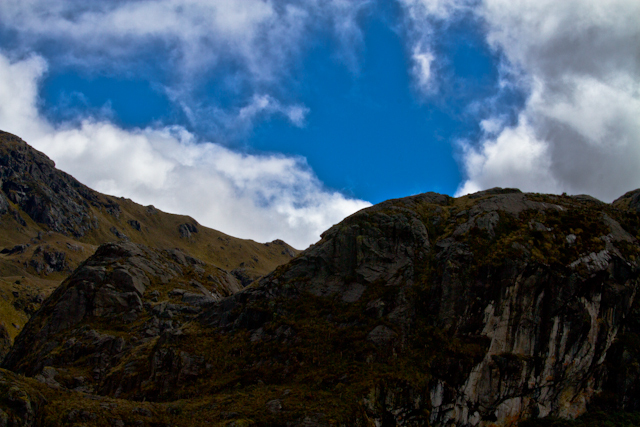 It was one of our favorite days of exploring since coming to Cuenca. Thank you Larry and Bea for joining us and making our day even more special. Now we're ready for our next adventure. I wonder where it will be? ?